There is a growing trend for actors to get behind the camera and direct. Alan Rickman, the English actor who first appeared in Die Hard and then in The Harry Potter films, stars in and directs A Little Chaos, a charming and delightful tale about the ambitious construction of the Gardens of Versailles in the late 17th Century by King Louis XIV, wonderfully played by Rickman. Oscar winner Kate Winslet (The Reader) stars a reluctant landscape gardener Sabine de Barra hired by the chief landscape architect Andre played by rising Belgian star Mathias Schoenaerts (Far From the Madding Crowd) who needs a suitable distraction away from his scheming wife Madame Le Notre wonderfully played by Helen McCrory (Skyfall). Stanley Tucci as the Duc of Orleans (The Devil Wears Prada) and Jennifer Ehle (Possession, Contagion) as Madame de Montespan make brief appearances as the French king’s brother and mistress respectively. 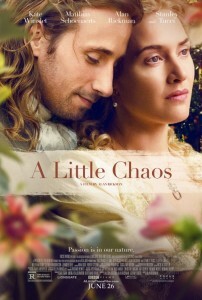 A Little Chaos is a wonderful, if at times slow moving tale of how one woman recovers from a horrible tragedy to reinvent herself as one of the chief designers of the intricate water features which comprise the huge and illustrious Gardens of Versailles, which ultimately elevated landscape gardens to unimaginable heights. There is a superb scene between Winslet and Rickman in a Pear Orchard where she comes across the French king mistaking him for a fruit expert and they soon bare their souls to each other and give very resonant reasons for wanting to embark on building such an elaborate project. King Louis XIV’s pivotal decision to move the French court outside of Paris to Versailles was more a way of deepening the chasm which separated the nobility from the peasantry. As the Duc of Orleans so comically puts it, Court is like a whole bunch of mice trapped in a castle, for none of the eligible nobility could leave the Palace without the King’s gracious permission. Naturally this divide was to become France’s ultimate toppling of the royalty a hundred years later as beautifully told in Sofia Coppola’s Marie Antoinette. 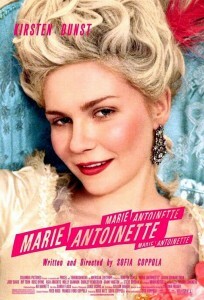 A Little Chaos is more about the machinations at court, the humble rise of a prominent and creative woman, who chose to take on a task in a man’s world, riddled with jealousy, doubt and deception. Kate Winslet adds a serenity to the role of de Barra while Schoenaerts ‘s role as Andre le Notre is unfortunately underwritten to the film’s detriment, making their onscreen coupling less believable than it should be. 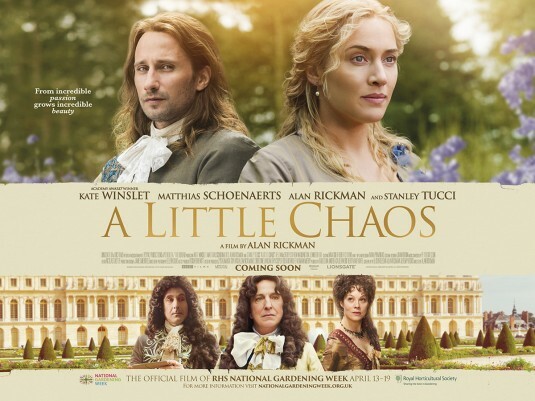 As a film, A Little Chaos, could have had a firmer more visionary director, yet its very genteel subject matter that of gardening and love make up for the slightly inert narrative. As cinema goes, this film is no match for the brilliant Stephen Frears’s Oscar winning masterpiece Dangerous Liaisons but while it is less sophisticated and complex, A Little Chaos is pleasant and beautiful to watch. Recommended viewing for those that love historical dramas without too much angst, yet appreciate the fascinating story behind the origins of the sumptuous Gardens of Versailles.